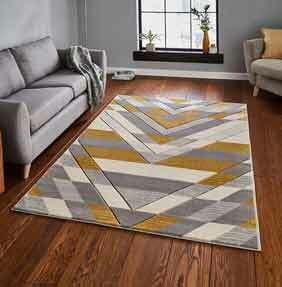 The two-tone design in the Pembroke rugs collection is what makes it so fashionable and popular. The rug is machine made using different tones and geometric shapes which create a stunning, contemporary effect to enhance any modern space, making it cosy and relaxing. The subtle grey and beige tones within this range, accented with mellow yellows and blues look stunning on both carpeted and hardwood floors. The high quality, long-lasting and easy clean pile mean that just because you are buying a cheap rug doesn’t mean you are losing out on quality and excellent value. This machine made rug is woven from 100% heat set polypropylene, the pile is 8mm long and is firm but soft to lounge on! Pembroke rugs come in 3 popular sizes and 2 designs.